When we first posted about Barbearian ($8.99) this past spring, I was kind of sold on it immediately. I mean, a game where you’re a bear who is a barbarian, and it’s called BARBEARIAN?? Sign me right up. I have come to learn though that it is in fact a human barbarian wearing a bear skin, but really that’s just semantics. Now that developer Kimmo Lahtinen’s fast-paced hack ‘n slash game is finally out, I can say that I adore it beyond its clever name as it offers some of the craziest action I’ve seen in a while. Gameplay consists of teleporting around to various locales and then beating the crap out of everything and everyone in sight with your trusty axe and a suite of various unlockable weapons. It’s a pretty simple setup. Of course there is some actual story elements explaining these exploits, but does it really matter? Don that bear skin and start hacking, I say! Enemies come in massive swarms, and each individual enemy is dispatched rather easily but when they’re in a huge group it takes a bit more work to clear them out. Something about the basic act of killing these swarms of enemies is so satisfying, almost like popping bubble wrap or something. As levels progress the swarms just seem to get larger and larger, and this is one of my favorite things about Barbearian. You know how in a match-3 game you’ll make a match and it’ll lead to a bunch of cascading matches and before you know it your screen is absolutely filled with unnecessary particle effects and explosions? Barbearian does that, but it results from the hundreds of enemies that you’re slaying at any given time instead of matches, and it’s great. Another completely superfluous touch that I enjoy a lot is the ability to destroy certain environmental objects like trees and fences. Unlike many games this can actually lead to uncovering an item or two, but mostly it just feeds into my weird OCD to clearcut an entire level. There is some strategy involved in Barbearian with your small selection of different moves and some light upgrade options, and you’re able to rescue and then recruit captured prisoners to bring into battle with you which is a neat touch, but by and large this is a button masher through and through. And I am totally OK with that. Something about playing Barbearian is just visceral and satisfying and fun. And isn’t fun what it’s all about? It’s also sufficiently challenging with several hectic boss fights that will really test your hacking and slashing skills. Barbearian supports MFi controls but works wonderfully with virtual controls too, which can be fully moved around and customized from the options screen (which you access by tapping the top middle of the screen during play, there’s no icon there but that’s how you pause and it isn’t very clear at first). I’d also HIGHLY suggest diving into the Accessibility options screen and cranking up the zoom all the way to 130% as by default the game felt way too zoomed out to me and doing this instantly made it feel “right." There is a ton to enjoy in Barbearian for hack ‘n slash action game fans. It’s perhaps not the deepest game on Earth but it does do some pretty clever things to spice up the gameplay and despite its button mashy nature it somehow never feels monotonous like similar games tend to. 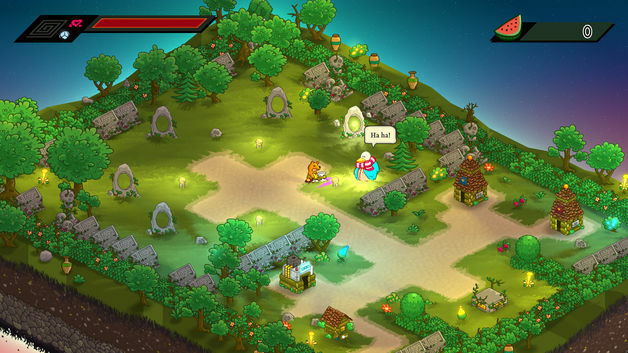 Barbearian is also a paid game with no IAP which is sure to please premium game enthusiasts. So if rocking a bear skin and murdering thousands of little undead skeletons sounds like your idea of a great Friday night, don’t hesitate to drop the cash on Barbearian and its more than a hundred levels of over the top fun.